Happy Tax Day! Across the country, today marks the deadline for individuals and businesses to file their income tax returns for tax year 2018. In Rhode Island, it is the deadline for approximately 650,000 personal income tax filers. Rhode Island’s income tax revenues are used to fund a range of essential services and distributional measures that support our state’s residents. Not the least of such measures is the earned income tax credit (EITC), a tax offset and income subsidy for low-income workers. This year, nearly 100,000 Rhode Island workers and their families will receive the EITC. These workers will be eligible for both the federal EITC and Rhode Island’s refundable 15 percent supplemental EITC. On average, EITC-eligible Rhode Islanders will receive a $300 supplemental credit against state income tax liability. Rhode Island’s EITC recipients are overwhelmingly low-income workers. The trapezoid-shaped credit is structured to phase out as income rises, so its benefits are concentrated among the working poor. The value of the credit offered at each income level varies by family size—a married household with three or more children is eligible for a state EITC up to $965, while a single worker with no children is eligible for a maximum credit of only $78. The EITC is an effective anti-poverty program, and one of few such programs to earn any semblance of bipartisan support. Rhode Island’s EITC has been expanded under both Democratic and Republican governors; it was most recently increased in 2016 under Governor Gina Raimondo. 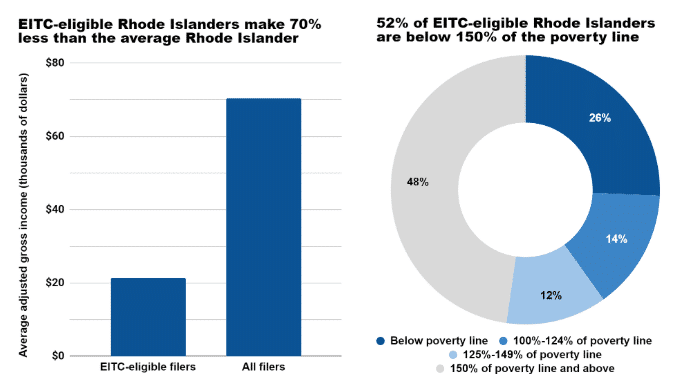 What can be said about Rhode Island’s EITC recipients aside from their low-income status? Understanding the demographics and economic standing of these workers and their families is essential to understand who benefits from EITC each year. To develop a broader understanding of EITC recipients in Rhode Island, we can turn to data from 400 EITC-eligible Rhode Islanders surveyed by the Census Bureau’s American Community Survey (ACS) between 2015 and 2018. The ACS is an ongoing nationally-representative survey that captures information on the country’s demographic and economic features. Its Annual Social and Economic Supplement provides detailed data on the characteristics of EITC-eligible tax filers in each state. ACS responses show that Rhode Island’s EITC provides relief to families with children: three in four EITC-eligible workers have at least one child, and nearly half are single parents. They also confirm that the EITC supports low-income Rhode Islanders: the average EITC-eligible worker has an income that is 70 percent lower than the average income of all Rhode Island tax filers, and more than half of EITC-eligible workers live in families that are below 150 percent of the federal poverty level. The EITC has powerful immediate and lifelong impacts on parents and children. Expansions in the EITC have been found to improve signs associated with mothers’ physical health and self-reported mental health, and the EITC has been found to improve children’s behavioral health and educational outcomes. The EITC is structured to favor both parents and children. Workers without children receive a credit that phases out quickly as income rises, while workers with children can accrue more income before the credit begins to shrink. 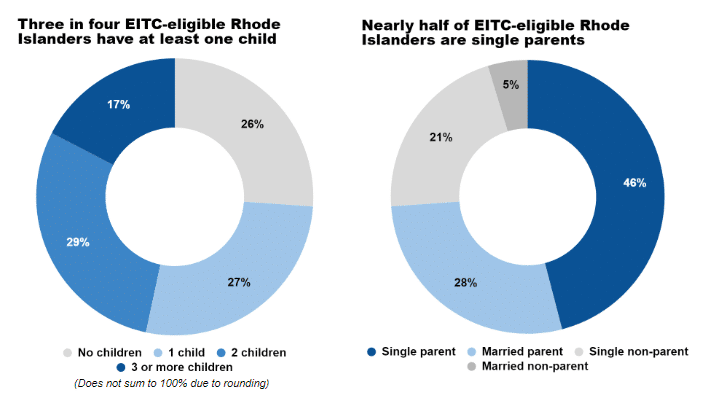 In Rhode Island, EITC eligibility is closely related to family size: three in four eligible workers (74 percent) have at least one child, and nearly half (46 percent) have two or more children. Nearly half of of eligible filers (46 percent) are single parents, and another 28 percent are married parents. In total, EITC-eligible Rhode Islanders care for approximately 138,500 children and 22,500 children younger than six years old. EITC-eligible Rhode Islanders work 35 hours per week on average, and 67 percent work full-time. This, of course, is in addition to the unpaid duties of parenting and caring for other dependents. Despite their work, these Rhode Islanders are not getting ahead. The average adjusted gross income of EITC-eligible workers is $21,423—about 70 percent less than the average adjusted gross income of all Rhode Island workers ($70,290). It is no surprise, then, that many EITC recipients are considered impoverished before the EITC is included in their income. About one in four EITC-eligible workers in Rhode Island (26 percent) lives in a family that is below the federal poverty level, and more than half (52 percent) live in families that are below 150 percent of the federal poverty level. By targeting relief at those just below or just above the poverty line, the federal EITC is very effective at lifting and keeping millions of adults and children out of poverty; the Rhode Island EITC appears to function in the same manner. Notably, the EITC offers nothing to those who do not perform labor market work. If an EITC recipient loses her job or leaves work to care for a family member, she faces a steep loss of income that can be economically and psychologically devastating. At the state level, proposals to strengthen RI Works and improve paid family leave address this shortcoming of the EITC. Strengthening the state’s cash assistance program, which has been stripped to its bones over the past 25 years, will support EITC recipients when they lose their jobs. Increasing access to paid family leave will support EITC recipients when they phase out of the labor market. 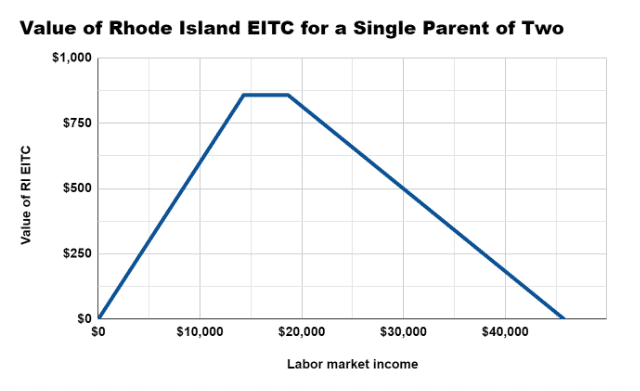 Is Rhode Island’s EITC sufficient? As filers receive their tax refunds this year, nearly 100,000 Rhode Island workers and their families will receive an income boost from the EITC. These recipients, as we have seen, are among the most economically strapped individuals and families in our state. Is an average credit of $300 enough for these families to make ends meet? Many state legislators and advocates do not believe so. This legislative session, several bills have been introduced to expand Rhode Island’s EITC beyond 15 percent of the federal credit. H-5245 and S-0272 would raise the credit to 20 percent of the federal credit, S-0129 would raise it to 18 percent, and H-5526 would raise it to 15.5 percent. An expansion would bring Rhode Island’s EITC closer to Massachusetts’ 30 percent credit and Connecticut’s 23 percent credit. It would also provide real relief to Rhode Island’s struggling families. "Andy Boardman is a policy advocate who frequently writes about economic matters in Rhode Island from an egalitarian perspective. He can be found on Twitter at @_andyboardman."